Do I have any idea what I'm going to talk about today? Nope. Is that okay? Yup. Did you know that I write my posts the day that they publish? I write them in the morning when the mood hits. If I don't write it's because I'm either really busy and don't have enough time or I'm just not inspired. Pretty much like yesterday. I went to see the counselor at my college to figure out what classes I need to be taking next. I made the drastic decision of changing my major to Business. Not my passion, I know. Not my forte, either, but it's what I know. It's what I've been doing for the last 15 or so years in the work world. So, there it is in a nutshell. I'm getting a degree that will actually help me more in my job. I figured that I know my passion is writing, but I can do that here. Also, I don't really believe you need a formal education to be a writer. Life experience and getting out there in the real world - I think that makes a fabulous writer. Oh, so I go to the counselor right? I have 32 or so units under my belt and if I go full-time for the next two semesters, I could transfer to one of the universities I want. But, um, that means I'd have to go to school full-time, work full-time, mother and wife full-time plus have enough time to get studying in and family time. Um, no. I'm just going to take classes as I can - slow and steady wins the race. That will now and forever be my motto for my college career. I'll graduate, for sure...just in my timing without any anxiety attacks or nervous breakdowns. After my morning appointment at the college, I was off to work and well, that's what happens. Work trumped blogging. Lunch did, too. Dinner as well. I wasn't even on social media much yesterday (what?!). The world didn't end. No one made a fuss that I wasn't here or on instagram or FB. That's awesome. No, really. See, the way I see it our lives need to come first. That's what gives us material for our blogs. Living life. Being in the moment. Being in it to win it. So, if you are a blogger (duh! ), don't ever feel guilty for not be "on" all the time. Sometimes we need a break. Perfectly okay. Take it one step at a time. Slow and steady wins the race (wink). PS: I had offered last week free sidebar space to anyone who wanted it:) I know, I'm pretty swell. Well, I tried my darnedest, but Passionfruit Ads just wasn't working for me...and, #sorrynotsorry, I'm pretty cheap and don't want to pay for the service - especially since I don't charge for sidebar space. So...I set up a slideshow of sorts and then the bloggers links right under. Pretty ingenious, if you ask me;) So give a little visit and love to my "Loveys to Follow", k? And if you'd like to be on the slideshow and link list, just email me with your 200x200 button image. Go to "Contact" - all the info is there (or will be shortly). Longest PS in the history of this blog - lol! Totally agree that life comes first! Go you for following your dreams! Love this! Life should always, always, always come first. 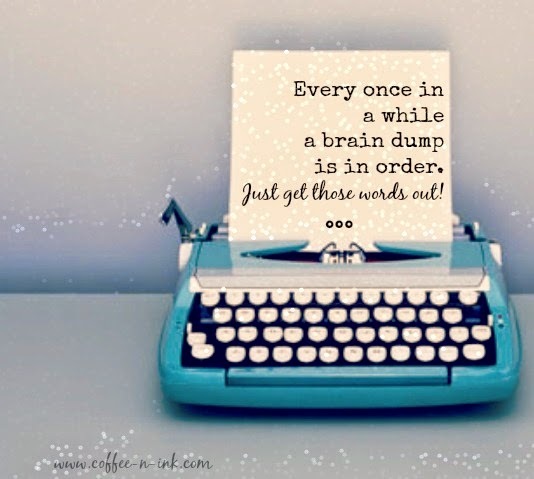 Sometimes I push myself to write (some may call it forcing it) to get the creativity out and to allow for some extra space in my head, but if there is something important going on in life ... I'm there. 100%. Brain dumps are the best sometimes :) Sometimes you have to find a balance. I'm on maternity leave from my job at the moment so am full time mummy at the moment (and recovering from surgery). As I sort of have some times on my hands I'm working on all sorts of bits and pieces.